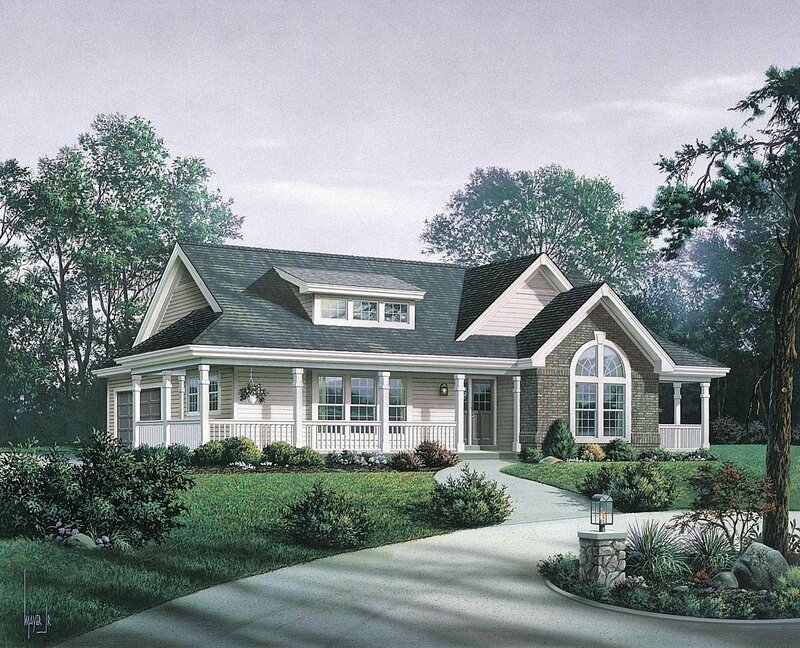 Houzz 99 of our visitors have told a friend about this plan. Answer: The ceiling height in both rooms are 12’-6”. The main ceiling height is 8’-0”. Question: Can you tell me the measurements for the island please? 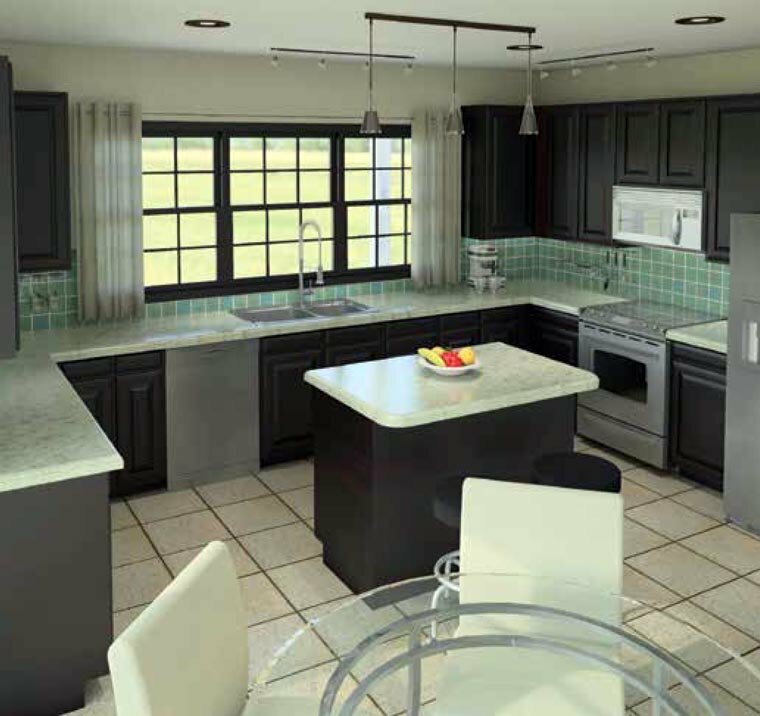 Answer: The island is 4’ – 8” top to bottom and 2’ - 9” side to side. Question: could you tell me where the measurements for the breakfast room start and stop? Do those measurements include any of the kitchen area? Answer: The width measurement from the windows to the front of the pantry is 11’-5”. The measurement from the front of the pantry to the entry is 9’-9”. Answer: Here is a little more information. Main Floor 1591 Total Heated Square Feet 1591 Unfinished Basement Lower Level 1591 Garage 420 Porches 479 Total Under Roof Square Feet 4081 All rooms have 9’ ceilings except the Great Room and the Master bedroom. They both have vaulted ceilings that start at 9’ and slope up at a 5/12 slope. Question: How may square feet is the garage? And how many square feet does the porches total? Question: What is the ceiling height in the kitchen? 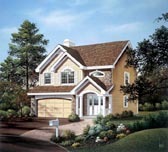 The plan looks like only the master bedroom and great room have higher ceilings. 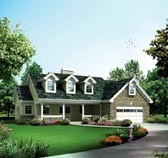 Answer: All rooms have 9’ ceilings except the Great Room and the Master bedroom. They both have vaulted ceilings that start at 9’ and slope up at a 5/12 slope. The dormer is just a façade and not an actual skylight or window that can be seen from the inside. Question: What are the laundry room dimensions and is that from wall to wall or open space in front of closet and laundry? What are the dimensions of the porch off the master bedroom? Also dimensions of great room withour bar and staircase? Answer: The dimensions of the laundry room are 6’-11”x 5’-6” from wall to wall. The porch off of the master bedroom is 10’ x 4½’. The great room’s dimensions are 20’-6” x 16’-3” of which the bar and the stairs take up about 3 1/2’ of the room’s length. Question: Can you make a second floor by u nvaulting the ceiling? 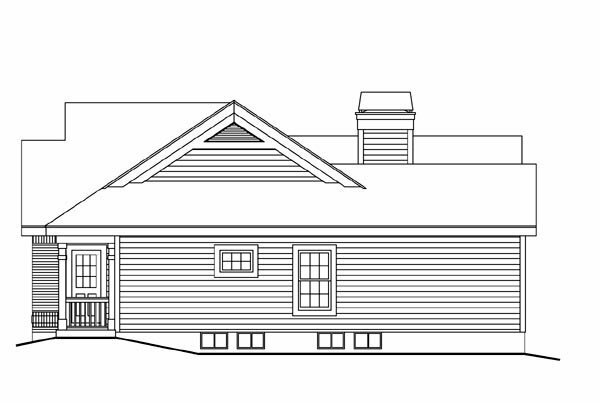 Answer: Yes, it would be possible to add a second floor to this design if the vaults were removed, the roof framing were changed to “stick” framing instead of trussed and a stair were added above the stair to the basement beginning where the wet bar is currently. The second floor area would be about 15’ x 34’assuming 5’ knee walls, front and back, leaving about 6’ width of flat ceiling (8’ above the floor) running along the 34’ dimension. If interested, they should pursue what it would cost to modify the drawings. Question: What are the dimensions of the laundry room? Question: What area was this house designed for? Answer: This home was designed by a designer located in the Midwest, but he designs homes for all areas of the United States. The plans we sell meet most National Codes (BOCA, Southern Building Code Congress and others). But, because national building codes change from area to area some drawings modifications and/or the assistance of a professional designer or architect may be necessary to meet all of your local codes. We advise you consult with a local building official for the specific codes in your area. Question: What are the bedroom sizes? Is kitchen open to family? 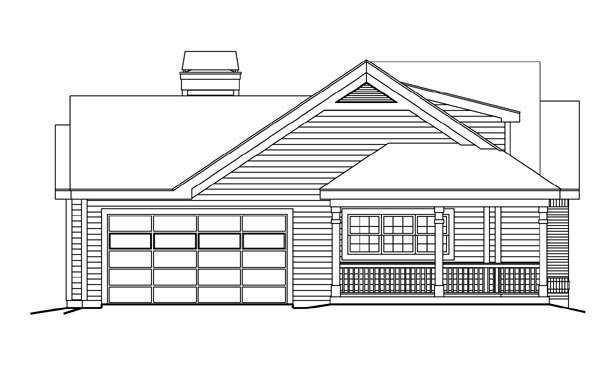 Answer: The kitchen is not open to the family/great room on this plan. The entry separates them. The bedroom sizes are below. Question: Can you give me the dimensions of the bathrooms? Answer: Below are the dimensions for the bathrooms. Question: Does this design come in 1400 square feet? Answer: Unfortunately, we do not have this plan in the square footage that you are looking for. However, you could have the plan modified to fit your needs. Answer: Thank you for your interest in our plans. Unfortunately, the dormer is just a façade and not an actual skylight or window that can be seen from the inside. Answer: Unfortunately, there is no finished attic space in this home. The only access to the roof trusses are the 22”x30” scuttles in the garage and in the bedroom hallway. Thanks. Question: Are there pictures available of the house as built? Answer: Unfortunately, we do not have any photos for plan no. 87811 available to view at this time.